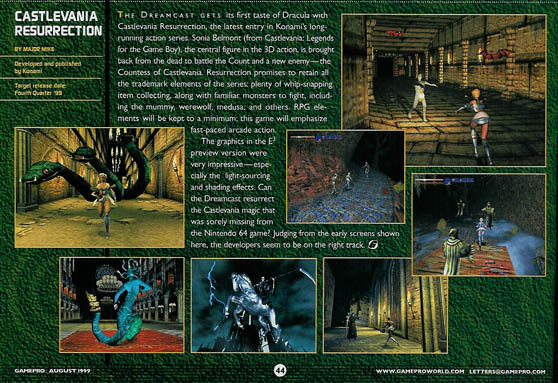 Castlevania: Resurrection, cancelled in March of 2000, was intended to be the seventeenth title in the Castlevania series for the short lived Sega Dreamcast console. This would also be the third Castlevania game, at the time, to enter the 3D realm. The game was to focus on Sonia Belmont and Victor Belmont, an 1800s vampire killer who had abandoned his lineage, in 1666, directly before Simon Belmont’s mission in the original Castlevania. Thanks to Celine for some of these screens! And Ryo Suzuki for the magazine scan. 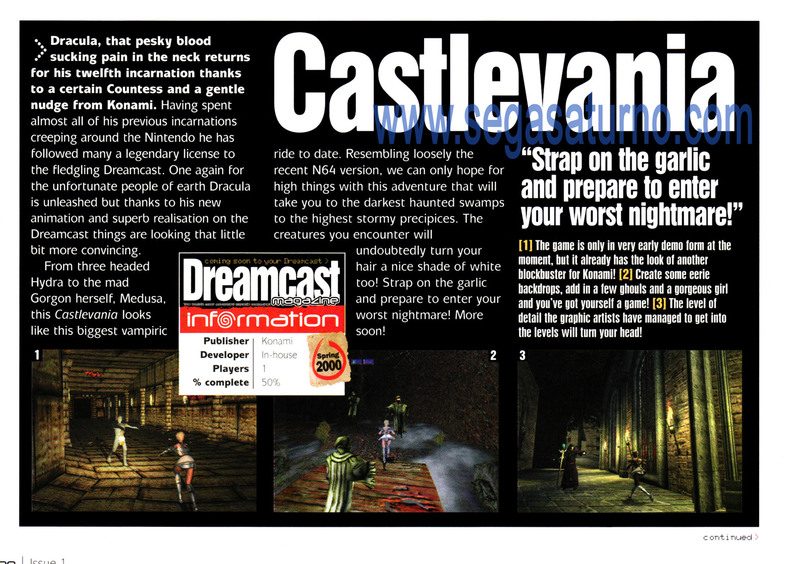 bizzare proof that sega could have saved Castlevania from becoming the repetative series it is now. the graphics are almost gamecube good. I have uploaded some of the unused soundtracks for the game on my youtube channel: https://www.youtube.com/channel/UCq4v3ZhpjyV3jLRw4-t68eg . The soundtrack is composed by Mark Lindsey and he also has a youtube channel as well: https://www.youtube.com/user/primarymark He also uploaded the CGI cinematic intro in higher quality and restored the music and soundeffects as well. If you are asking where I found the tracks. They were downloadable at http://www.vgmuseum.com/mrp/multi/mp3s7.htm#cv-res I am going to upload the rest of the songs. I have a request. Can you include my unused soundtrack uploads as part of the videoes of this page about the cancelled/unreleased Castlevania Resurrection for Sega Dreamcast. So people can get to experience the unreleased soundtrack from the game. Somewhere there has got to be a copy of the unfinished game. This needs to be leaked/released to the public so someone can give it the Resident Evil 1.5 treatment and finish it. Or at least make it playable. I’d sell my soul to Dracula to be able to play a Dreamcast Castlevania. Excuse me, but there seem to be some stuff missing one on of the main villains of the game. The Countess. Here’s some info from here from the Castlevania Wiki http://castlevania.wikia.com/wiki/The_Countess. Also after watching the unused intro for this the female vampire that appears in it looks different to The Countess in my link and appears to look younger with longer hair. Might be something of use in there. Press i sent does mention game had far less exploring and was more action based than the 2D games, so a little shallow perhaps for what fans might of expected. Why’s wasted this gem on useless dead console. Release this in the form of GameCube exclusive would be biggest hit! F*** developers for letting a cancellation.